Collins Epic Wargames is happy to say that they'll have their Frontline General: Spearpoint 1943 Map Expansion available at Origins coming up this week. 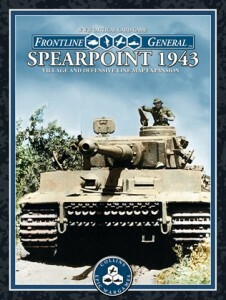 Collins Epic Wargames is pleased to announce release of the Frontline General: Spearpoint 1943 Village and Defensive Line Map Expansion, which will occur May 31 at Origins Game Fair. Take Spearpoint 1943 to the next level with this gorgeous terrain-based expansion. A mounted map, 4" square die-cut tiles, large counters, Marc von Martial artwork, fiction by Mark H. Walker, and 17 video tutorials linked by QR Codes from within the printed rules are just some of the highlights. MSRP: $55. Code: CEW00005. Available worldwide May 31.